CANNA COCO has a high but relative Cation-exchange capacity (CEC). This means the substrate has the ability to hold and retain certain nutrients vigorously thus requiring these nutrients be supplied in a special form that remains available to the plant. Due to the special Coco characteristics in combination with the unique pre-buffering process, it is possible to combine vegetative and flowering nutrients in one nutrient mix. The media and the plant itself control which nutrients are released to the plant at just the right times. This means the grower doesn’t have to worry about the proper point to convert from grow to bloom nutrients! CANNA COCO is a two-part nutrient; hence there is an A&B version. This is essential because the concentration and forms of the nutrients supplied interact with each other in the concentrated form. This interaction can cause non-recoverable precipitates and an overall change in those specialized COCO forms of the nutrients. Hit the Max with COGr! Besides CANNA COCO, CANNA developed a COCO substrate especially for the more experienced grower: CANNA COGr. 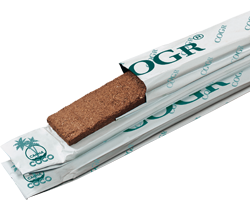 CANNA COGr is compressed COCO and consists of a sophisticated mix of COCO fibers, COCO peat and COCO husks. Thanks to the coarse COCO structure, COGr has the unique property of absorbing large amounts of direct available water and nutrients. At the same time the open structure ensures enough air is available for the roots. COGr is both pressed and dried, which makes transport and storage very comfortable. In order to prepare them for use, they are soaked and buffered with a special solution: COGr buffer Agent. After adding Buffer Agent the boards will increase in volume from 3 to 17 liters. 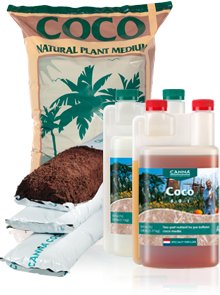 CANNA has developed 2 special COGR fertilizers, COGr Vega and COGr Flores. 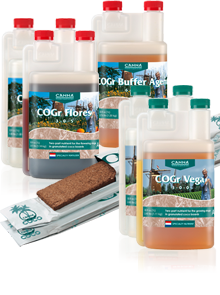 COGr Vega and COGr Flores contain all plant essential nutrients (macro and micro) necessary for grow and bloom COGr can be reused up to 3 times without any loss of quality. Martin and Gerhardt are two Swiss growers who have been growing since the early nineties. Since they started growing on CANNA COCO products, they never let another medium enter their greenhouses. Two years ago, when they switched from COCO to COGr they easily produced six harvests a year with little effort.